Combat Arms, Nexon’s free-to-play online FPS, has introduced an all new map for players to destroy each other in. This latest map has players killing each other in the most appropriate — or inappropriate — of places; depending on your feelings about cemeteries. 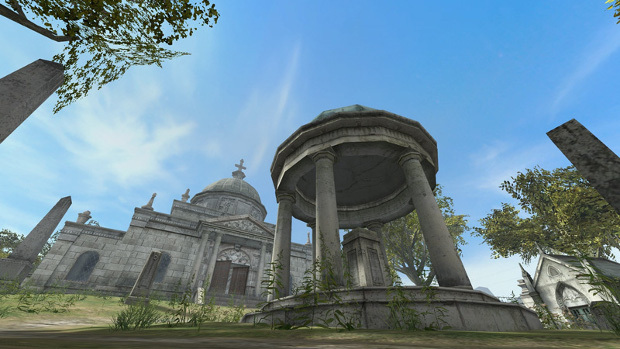 Titled Heir of the Tomb, the map has players fighting each other over gold hidden away in the tomb, by a now-dead gang leader. In addition to the new map, Nexon has added an inventory increase — so you have somewhere to keep all that gold you’re fighting over. And! As an added bonus, all players will receive a +100%XP/GP boost while playing on the Heir of the Tomb map between now and March 2. Wow! This game is still alive? Outside the PvE modes this game is completely Pay2Slay. The premium weaponry and classes are brutally overpowered and just reap down average players. Not to mention the zombie PvP, where with average weapons, there is almost zero chance winning against zombies, while the premium rocket and grenade launchers can down them within seconds. Even the PvE maps were balanced in a way that normal weaponry won’t suffice on higher difficulties. I just can’t understand how could I spend 200+ hours on that game. I stopped playing about 5-6 years ago and didn’t regret a single minute spent away from that game. Is there an FPS that is more pay2win than Combat Arms? If there is, I have yet to find it. Surprisingly, it’s not pay2win anymore, it’s gotten much better in terms of the store but not sure how everything else is right now since I haven’t played in around three years aha. Are you f*cking kidding me? The pay2win and power creep has only gotten worse. The top-tier items are still cash shop exclusive. They made some lower-tier cash shop items (that were still superior to the free items) obtainable by free players, albeit at with high rank restrictions and very high GP rental costs. Not only did the release of cash-shop upgrades (such as +22% damage upgrades) for said items completely offset this move, but it also invalidated previous cash shop purchases. It never ceases to amaze me how people are so easily fooled by underhanded moves like this. As if that isn’t bad enough, there’s the cash shop item that lets people instantly kick better players from the game at will. That’s pay2win in the most literal definition of the term. Free players can obtain one after an utterly insane amount of grinding, and it’s still inferior to the cash shop version.